This is perhaps the most favorite product of this year that I was looking forward to review. The ASUS Vivobook S is a game changer being lightweight as well as highly qualified even for gaming. So if you’re an on the go user like me, this is probably one for you to consider. Do ensure to check out my unboxing video before proceeding to read the below review! ===> Unboxing! The outlook is breathtaking as you could see the brushed aluminium design which keep its profile high. ASUS is well known for their designing skill when it comes to notebook. They didn’t leave out this model as every single design language is made to perfection. I always wanted to have a gorgeous looking notebook which is capable of handling my graphics/video editing requirements, hence the Vivobook S is perhaps the most suitable one for me. Even the bottom of the laptop is colored to match the overall outlook so that it doesn’t look awkward. On the left of the Vivobook S, there are two USB 2.0 ports side by side accompanied by SD card reader as well as the LED activity indicator. On the right side, there are the 3.5mm audio jack, USB Type – C, Full Sized HDMI port, USB 3.1 and the charging port. 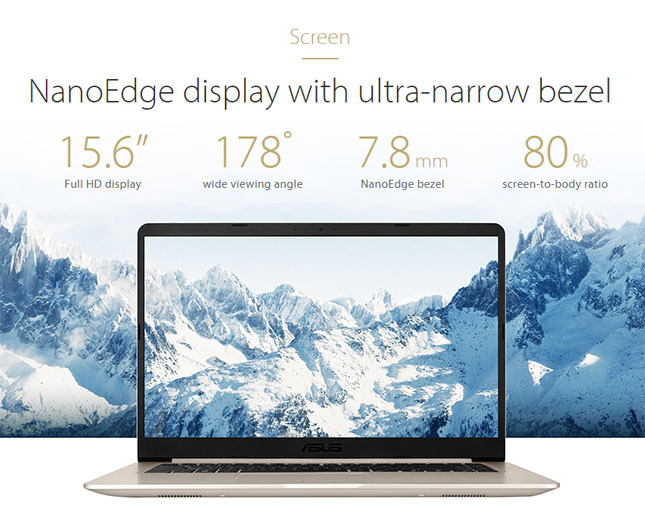 The display itself which is sized at 15.6 comes with a Full HD resolution and NanoEdge. It makes the display larger while the bezel gets thinner. Similar to the way where smartphones are heading to, full screen display? Plus point of this will be the overall size of the entire notebook. Since the bezels are slim at only 7.8mm11, the size shrinks and feels much like a smaller sized notebook. Not to forget, the display technology is IPS which makes it brighter and vivid. The display type is non-glossy which can favor to those who hate fingerprints all over, but I personally prefer the glossy type which feels much cozy while viewing. Movie watching or gaming feels really great, main reason being due to the NanoEdge+IPS combo. Together with ASUS Tru2Life technology, the video and images are certainly feels sharper and clearer as it manages to capture the frame rates in a faster manner and optimizes it for better viewing pleasure. You can play with the screen’s color production via “ASUS Splendid Utility” that comes with the laptop. Choose the Vivid more or you can also opt for Normal mode if you prefer it to be like how it is by default. Not to forget the Eye Care mode which works to filter out the blue light to protect your eye sight. If you are the type who prefers to set everything manually, there’s also the manual control mode for you to set the color temperate according to your own taste bud. As I have mentioned earlier, the Vivobook S comes with dual speakers facing towards the user which is placed beneath the laptop. The sound quality isn’t the loudest yet clearest of what I have encountered before, however it doesn’t sound that bad either. 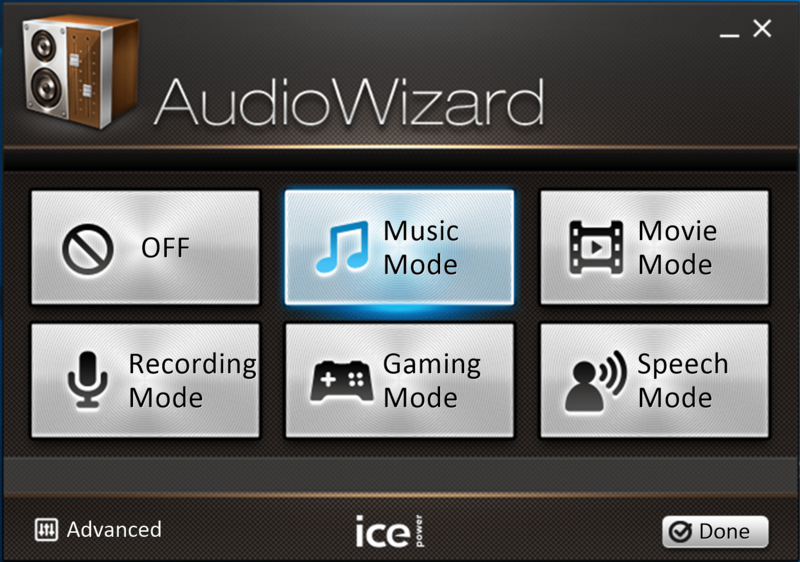 As usual there is a software for you to tweak and adjust the basic output settings which you can set according to your liking known as ASUS AudioWizard. 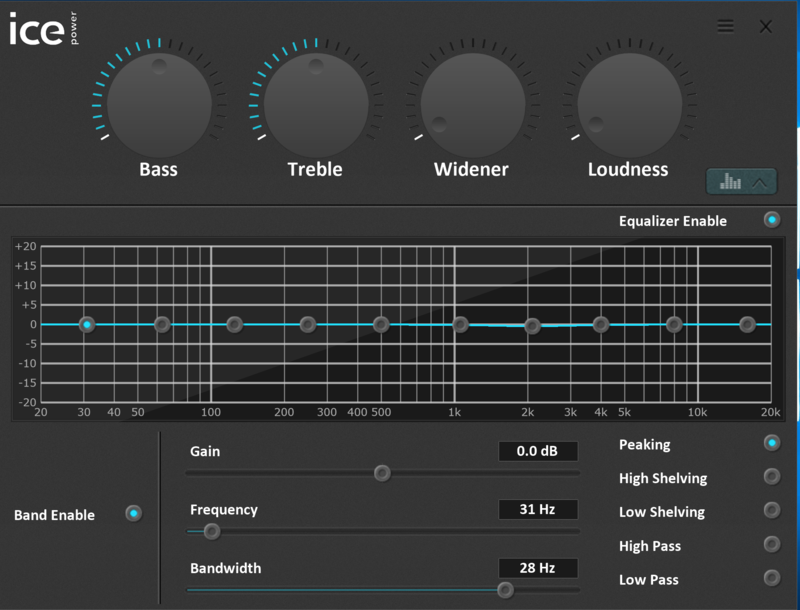 For advance tweaking, you can check out the new custom EQ which allows you to set your own custom equalizer by varying individual frequency bands. Based on my unboxing video, you would have already known the specifications. 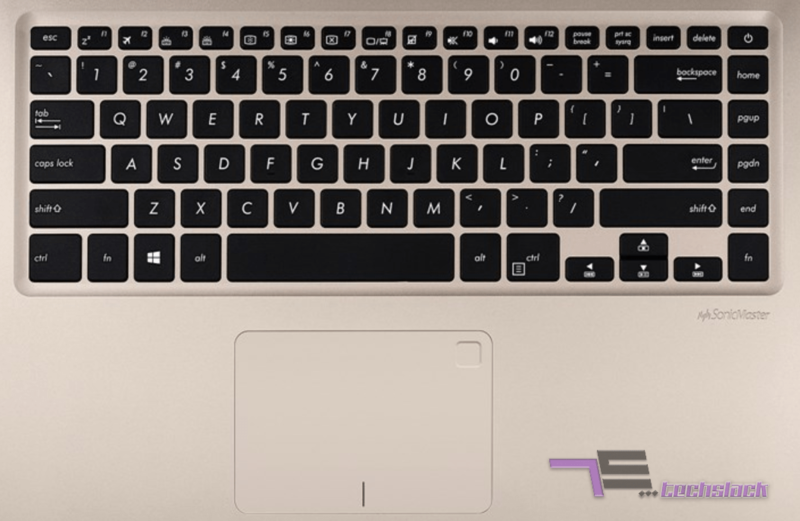 There are several models of the Vivobook S that is present in Malaysia which I have listed down for your reference at the end of this review. The obvious difference that I have for this model will be the additional 128GB SSD as well as i5 7th gen. The laptop does not get too noisy during my usage period, maybe due to my limitations of just keeping it for my documents editing as well as emails. Watching Youtube for a long period did not trigger too much of the fan noise though, impressive compared to my current laptop. I did some basic video editing and of course the CPU usage shot up abit to trigger the fan noise, though this is totally common whenever you render anything huge in size. It certainly rendered faster than my current laptop which is running on i5 4th gen. The one that I have comes with M.2 SSD on top of the 1TB hard drive. Booting up is notably fast and this is a plus point for those who setup the operating system and software on SSD while you can utilize the 1TB hard drive for storage purpose. The keyboard in fact feels really comfortable when you start typing. It does take a little time for you to get used to it as the dimensions are certainly wider and compact compared to standard ones. It does feel slightly weak when you apply some pressure on the keyboard, probably due to its thin plastic beneath the keys. Overall, the keys are surely quiet and feels just right for me during my typing session. Best part of the keyboard would be it’s tri-level white backlight. This would be helpful for those who work on low-light environment but for me it’s just for the added class and attention seeking capability. The dimension of the trackpad is 5 inches (10.5 cm x 7.5cm) and worked pretty impressive in terms of its responsiveness. 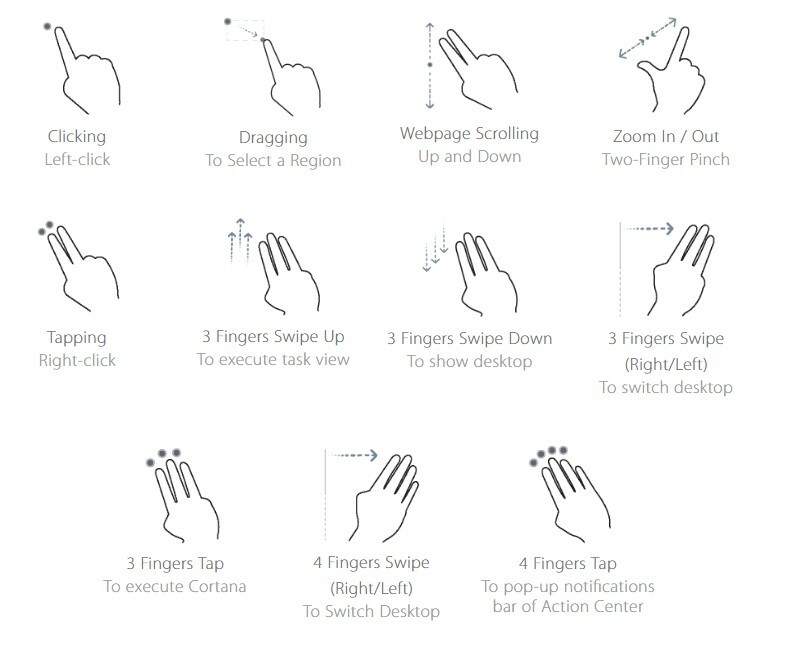 There are several custom gestures that you can utilize here on the Vivobook S. You might end up not using these features but getting used to these will make your life easier actually. Together with the value added fingerprint scanner, you have that extra security which you might end up not using at all. I did have some hard time getting used to it. However, once you keep spamming this feature things get a little interesting and pretty addictive, similar to your fingerprint unlock enabled smartphone. 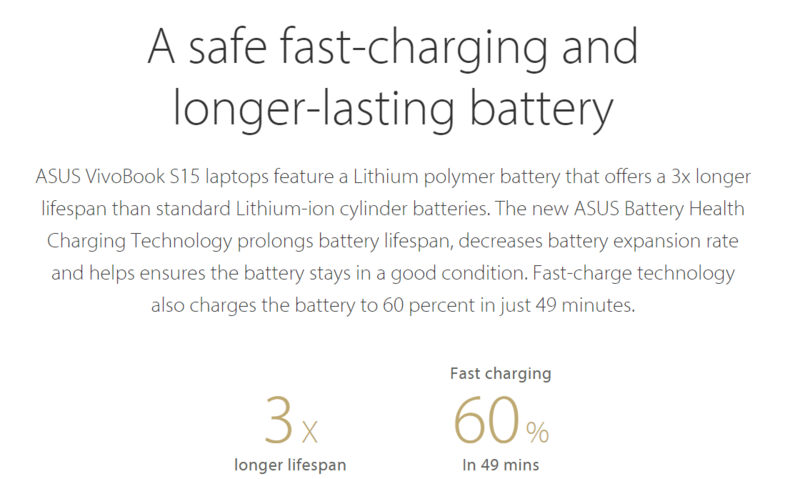 It is clearly stated that the battery could last up to 8 hours on the laptop hence we would surely expect it to last for a good amount of hours right? I managed to get that solid 8 hours on the days that used only for blogging/editing documents/emails while there was video editing/streaming involved – it lasted to about 5 hours. You should only consider the ASUS Vivobook S if you are looking for a lightweight laptop which has that attractive looks as well as a decent battery life for those who do a lot of business related stuff on-the-go. 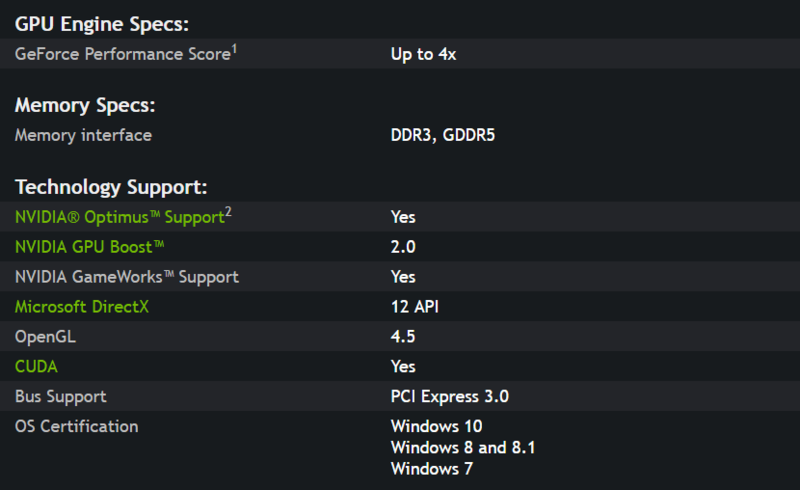 There are of course several other options to choose from including the ones which are powered by 8th gen processors. My advise would be sticking to the one I have as the 7th gen is good enough and you get the SSD storage too! Below are the i5 variants that is available in Malaysia, there are i7 variants as well which offers up to 2TB+512GB SSD for your interest. The VivoBook S510U (QBQ410T) is priced at RM3299 and available at any authorized dealer near you. You can opt to buy via their online shop on LAZADA. P/S: Don’t forget the free backpack that comes together with the laptop! VGA Camera is a disappointmentEnabling touchscreen would have been usefulHinge is limited and not able to go down fully flat to 180 degree. Previous ArticleMalaysia Spam call on the rise!